Farmers and gardeners are giving up fighting many of the invasive plants they once considered “weeds,” and selling them to chefs, CSAs and health food stores, making better profit for less labor. Not only are these weeds making them more money than many of their traditional crops, because of their “invasive” nature, they take no work at all to grow. Invasive plant species produce large quantities of seeds that are spread long distances by birds, wind or humans. They thrive where traditional agricultural crops can no longer grow because of damaged soil and repair the soil with their long, dense root systems. While most farmers hate them for competing with their labor-intensive, annual crops, New York City forager, chef and author Marie Viljoen encourages them to give in to the free food Mother Nature is providing without them so much as lifting a hoe. With no tilling, fertilizing, planting, weeding or watering required, farmers could make a killing just by going out and harvesting what grows naturally, she says in an article for Saveur. The sour crimson fruits of autumn olive (also called autumn berries) are as tart as red currants and can be used in similar ways. Their high lycopene content can cause jams to separate, but their color and flavor invigorate sweet and savory sauces and fruit leathers. Peeled burdock stems are crisp and versatile. Dip them into hummus or braise them. Burdock’s cold-season taproot (better known as gobo) is a substantial, starchy vegetable that takes well to slow, moist cooking. With its appealing flavor of nutty corn silk, spring chickweed is a delicacy best appreciated raw. Its tender stems, leaves, and flowers are ideal fillers for summer rolls, and a gentle bed for seared seafood. Familiar dandelions are the gateway plant to eating weeds. With crisp rosettes in late winter, mild leaves and succulent stalks in spring, and assertive flavor in summer, dandelions’ evolving profile makes them appealing throughout their growing season. Prolific field garlic (also called lawn chives, or wild garlic) is sold in neat bunches at New York City green markets. The little wild onions fetch $3 a bunch. The bulbs and leaves are a sustainable—if diminutive—alternative to vulnerable native ramps. Spreading thousands of seeds after flowering, biennial garlic mustard inspires ecological ire. Edible in its entirety, the plant offers second-year roots tasting like horseradish, leaves that are a gustatory marriage of broccoli rabe, mustard, and garlic, and budding stems in late spring that are an ephemeral delicacy. Japanese knotweed is notoriously invasive, but also delicious. It will definitely become more familiar as a market vegetable in years to come. Its mid-spring shoots resemble asparagus, but taste and behave like an earthier version of rhubarb crossed with fresh sorrel. Use it raw or cooked, especially in savory dishes that need a sour boost. Mugwort’s feathery leaves are packed with a sage-like fragrance that is wildly versatile in the kitchen. Author and wild foods purveyor Tama Matsuoka Wong says they are “awesome as tempura.” From its first shoots through to its winter stalks (which can be used as kebab skewers), this under-appreciated herb is about to experience a slow-burn renaissance. Known as poke sallet in the South, this indigenous but prolific plant was originally eaten by Native Americans. It is a succulent spring vegetable when blanched in ample boiling water, but it must never be eaten raw. Pokeweed’s notoriety stems from livestock poisonings or improper preparation … but once blanched, young poke shoots are delectable. 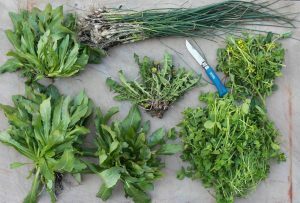 The early-season alternative to watercress, wintercress (also called creasy greens, wild cress, or upland cress) is a land dweller whose leafy heat is reminiscent of wild arugula. Later in spring, wintercress stems shoot up, bearing acid yellow flowers. These tender morsels, like baby broccolini, are a prime and ephemeral spring ingredient. Can you get sick if you misidentify these things? I’ve had dandelions, mugwort, burdock, garlic mustard, and wild onions/garlic and am OK. I don’t know about the others, but poke weed is definitely toxic once it turns purple. Pokeweed is toxic merey to touch, with no reference to purple. Actually, generally speaking, unripe fruits tend to be more toxic than ripe. Google “pokeweed mitogens.” Even from handling, the plant can set off a weird proliferation of lymphocytes, which led to its role in immune system research. Don’t take my word for it…internet work will indicate leaving pokeweed alone. people here in my neck of the woods pick it and fry it. never seen a problem with it. in the spring young shoots (6″ -8″ tall)of pokeweed should be snapped off at ground so that you get no part of the roots. Parboil twice throwing those waters away. A favorite way to eat in the Appalachias is to roll the parboiled pokeweed in cornmeal and fry. I know from experience that if you don’t properly parboil them first, you’ll have a night of diarrhea and cramping. They’re one of the first plants in spring that sends up shoots so if, as in the old days, you were craving some fresh greens these were a welcome sight. They used to sell poke sallet in a can for goodness sakes. As a child growing up in the south, we used to paint ourselves with the purple berries. Our moms just warned us not to eat them. In the spring a big plate of poke salad with hot crispy cornbread is so delicious! My wife has cooked poke salad, she brings it to a boil then pours off the water and puts in new water to cook. Be sure to put in streak o lean or ham scraps and salt to taste. I thought you could only eat the leaves of burdock, not the stems. Or is the entire thing edible? I know rhubarb leaves are poisonous, but the stem is ok.
Jenn, the burdock root is delicious! earthy in nature of taste. Cut up just a like a carrot for stews. You can also purchase burdock root at chinese food stores, known as Gobo root. Excellent fall food to gently “sweep” the liver. Yes. Never eat any wild plant that you have not absolutely identified correctly. If you misidentify anything it can make you sick. Depends how bad your misidentification is. For instance, if you are planning on having a baked potato, but instead try to eat a baked housebrick, then it can damage your teeth. I’m partial to Purslane, another invasive plant that is delicious. The succulent leafs can be added to salads, cooked, it’s great in stirfrys, soups, and egg dishes. Where can you get the seeds? West Coast Seeds has the domestic variety, there is also a wild variety that came into my garden and is actually a problem I can’t get rid of. I love purslane but if you cultivate it, I would highly recommend doing it in a separate patch, away from your garden. I grew in it my garden last year, and when it went to seed it spread seeds all over my garden. It came up this year, and choked out everything else I had planted! What am I missing…article titled 10 weeds..I see 3? There are 10 listed and accompanied by 10 photographs… what are you viewing this on a nokia 3310? I’m looking at it with chrome browser on a PC. It doesn’t show 10 items, it only shows 3, with no option for next page or anything. It ends with chickweed. I only see three as well…. on my laptop. I kept scrolling up and down looking for a “next page” link or something. glad I’m not alone. I only see 3 also. I am on a computer, and I am searching around the website for something to click on, but there is nothing. With Chrome on a PC I see 3, but with the same link and Firefox I see all 10. Only three here too, laptop, Firefox. If you are using an ad blocker, try pausing it. I had the same problem, but temporarily turning off the ad blocker fixed it. I`m a new user an want to know to cook them example dandelions? That is very abundant in Saskatchewan CA. Use them as a salad leaf with a simple dressing (extra virgin olive oil & freshly squeezed lemon juice) or use them like a spinach leaf. Wash the leaves well and scramble briefly in eggs. If you get them before they flower, they are sweet. We look at weeds in an entirely different way these days. There are many plantain and stinging nettles in our garden. So far we have used the nettles in soup and wow was it totally creamy smooth.Hope other folk come to realise the many healthy benefits of garden weeds and stop the idiotic spraying which damages everything. Wake up sheeples. Nettles are delicious and extremely good for you. I think I have stinging nettles growing wild everywhere in my yard but I’m not sure if that is what it is. What is a good source for identification of these plants. I was only seeing 3 until I disabled my ad blocker, (mentioned in other posts). There are 10, so this person’s integrity is not questionable. There are 10. You just can’t see all of them. Lambs quarters are my favorite vegetable – very similar to spinach. Somehow we have less of it this year, and I miss my weeds! any chance of updating these with scientific names? common names and pictures are helpful, but know exactly which wild plant your eating is the safest way to be sure it’s not a poisonous look-alike. great list though! Interesting article but I’m only seeing 3 suggested plans and the article says 10. Typo? I see three – autumn Olive, Burdock and Chickweed. Great article. Thank you. My one concern is correctly identifying these plants. Are there similar looking poisonous species we can mistake some of these with? Those autumn berries look similar to nandina berries. I think they must be what we call Russian Olive? 3 is not 10. Where are the other 7 “weeds”? Look at the comments above for why and what to do about it. This is a great article, I wish you had it in a printer friendly PDF file so I could print it and use it as a reference. Might be a good idea to offer that on future posts. I thought I knew how to count. I guess I can only count to three because that is all I see on this page, unless your web designer doesn’t support Google Chrome web browser. I was looking forward to seeing what weeds I could nibble while sitting out in the yard, reading. Try Firefox. Works for me. Thanks for sharing , photographs are excellent for identification ,which I will use .Thanks !!!!! Please write up pieces like this *with* the plants Latin names. Also if you mention that a plant “inspires ecological ire” and leave this point unsupported, even with a link, readers are left dangling. Everyone who writes about the environment had best make the text robust. In the UK at least we consider Garlic Mustard one important food plant for butterflies. no lambs ears or shepherd’s purse?? Lots of folks only seeing 3 weeds. I see all 10 with my iPhone 6 and Safari browser. It seems to be chrome causing the problem. Copy and paste the web address into internet explorer and the whole article is there. wintercress (also called creasy greens, wild cress, or upland cress) is a land dweller whose leafy heat is reminiscent of wild arugula. (I’ve sure wasted a lot of this over the years). Here’s seconds to the commenters adding purslane and lamb’s quarter. @Jane Eades, in the US, Garlic Mustard has recently (ten years now?) taken over large swaths of park and forest, and US readers are likely to have seen something about it in newspaper features. Strange because I see 10. You have to scroll payy the the annoying drug ads to see all ten. When I was a child in Colorado, my mother used to send us out for wild asparagus that grew along irrigation ditches, and purslane (Spanish: verdulagas) a weed that grew in abundance. Delicious in flavor with a bit of a rubbery texture. We also used to gather wild spinach (Spanish: quelites) which had a slightly sugar like coating on the leaves. Also very delicious and nutritious! Somewhere I have photos of these edible weeds! Where’s the rest of the list? I’d really like to try some of these but everyone I know who has a yard in North Carolina has them sprayed for mosquitos each month. I’m too afraid of that poison. Please don’t grow or plant garlic mustard. I am still dealing with it in my yard 8 years after it creeped over from my neighbours. It is extremely invasive. Any hints on how to get rid of it? You missed purslane and wood sorrel. Overly abundant aaaaaand delicious. your site only shows me 3. please fix the site to work in all browsers. Can’t believe how rude some people are…’please fix your site to work in all browsers’. This is a FREE page to view, someone has given up their time and knowledge to spread and share this valuable information. And people whose browser or settings mean they only see 3 of the 10 (at least until they fix their settings) are whining as if it were bad service in an expensive restaurant they’d paid for, or being sneery about the site’s ‘integrity’ because they’ve not bothered to investigate properly. Poor show, ingrates! In the springtime we have wild mustard here in Arizona. It is a delicious spicy green that has a sharp radish/watercress taste. I am from Yorkshire England…….We have a fizzy drink (soda) here made from dandelion and burdock…….It’s absolutely gorgeous…And l have always said it is great for my digestion…….